A chime stood on the altar. There was a range of instruments, including trumpets, violins, and chimes. Lucy heard the chime of the church bell. The bells were chiming for the evening service. The bellringers grasped the ropes and pulled them to chime the bells. The church bells chimed midnight. "Good morning," the children chimed, as their teacher arrived. It seems our views on this issue don't chime. wind chimes: a decorative object made from metal or bamboo tubes, bells, shells, or similar objects, that chime when moved by the wind. and you can also read about the work the campaign does on its website here. A chime or chimb is also the part of a barrel where the staves (the bits that make the rounded sides of the barrel) protrude above the top or below the bottom of the barrel. Chime dates back to the late 13th century. The Middle English noun chymbe originally meant ‘cymbal.’ A part of its origin is uncertain. Some linguists think it emerged as a shortened form of chymbe-belle, which was actually a misinterpretation of chimbelle, from the Old English cimbal or cimbala (cymbal). Others believe that it came into Middle English from the Old French chimbe, which was already a shortened form for the instrument. In this theory the French word was, again, misinterpreted as chymbe-belle, which is why both chymbe and chymbe-belle appeared in Middle English texts around the same time. Whether it came from the Old French or Old English source, chime can be traced back to the Latin cymbalum (cymbal), from the Greek kymbalon (cymbal), from the Greek kymbe (a bowl or drinking cup). The sense changed to ‘set of bells in a church or clock tower’ or ‘apparatus for striking bells’ around the mid-15th century. 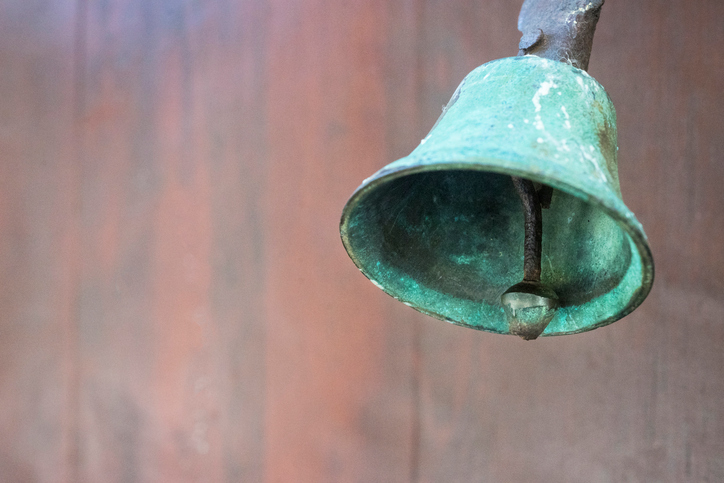 The meaning ‘set of bells tuned to a musical scale’ dates back to the mid-16th century. The verb comes from the noun. The Middle English verb chymbe dates back to the mid-14th century; it was only originally said of metal, but expanded to describe human voices by the late 14th century. The expression to chime in originally meant ‘to join harmoniously’ and was only used in the musical sense. It expanded to conversation by the early 19th century.